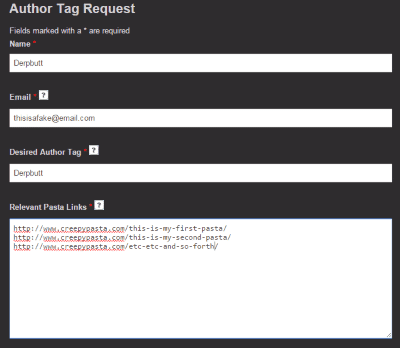 After many requests for this feature, I will finally be implementing an author tag function. This means that authors who have had at least two stories accepted and posted to the main Creepypasta.com archive will now be eligible for their own tag. IF YOUR STORIES HAVE ONLY BEEN POSTED ON CRAPPYPASTA, YOU ARE NOT ELIGIBLE FOR AN AUTHOR TAG. IF YOUR STORIES HAVE BEEN SUBMITTED BUT NOT ACCEPTED, YOU ARE NOT ELIGIBLE FOR AN AUTHOR TAG. IF YOU ONLY HAVE ONE STORY ACCEPTED, YOU ARE NOT (YET) ELIGIBLE FOR AN AUTHOR TAG. 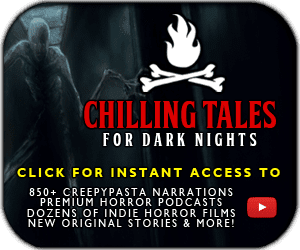 YOU CANNOT REQUEST AN AUTHOR TAG FOR STORIES NOT POSTED ON THIS SITE (IE: Requesting an author tag for stories that are on the Creepypasta Wiki, but Creepypasta.com. This should be obvious, but I know that if I didn’t write this here, someone would certainly attempt to do it anyway)! DO NOT REQUEST AUTHOR TAGS FOR STORIES THAT ARE NOT YOUR OWN WORK. I keep all submission records; this means that I have on file the email addresses tied to every submission. This means that author tag requests will be double-checked against the on-file email accounts (and IP addresses if necessary); request. If I cannot confirm that the person requesting an author tag for a pasta is, in fact, the author, the story will NOT be tagged, so do not waste your time attempting to get tagged as the author for stories you did not write. This also means that you should not “try to help” by submitting requests for other authors; if they want a tag, they can go through the process themselves. If they do not want a tag, they will not bother. The process is opt-in for a reason. If you are flagrantly and obviously trying to steal credit for a story that clearly isn’t your own, I will ban you from both the site and submissions. Don’t be a jerk. Author tags will show up at the end of a post, just like the current tag system. Likewise, they will be browsable via the sidebar under the tag menu. They will be accessible under the “Author” heading of the tag menu. This is not required, as I’m aware that people may have reasons for not wanting a tag despite sending in multiple pastas. Author tags are purely opt-in, so in order to get your tag activated, you need to fill out this form. Please double-check that you’ve filled in your email address correctly, and make sure that you’re using the same email address that you’ve used for your past submissions. After submitting your request, please be patient – this will be a time-consuming process for me as all requests will have to be confirmed and added manually on top of other day-to-day backend work, so do not expect immediate results. I will email you with any issues and/or upon confirmation of your tag’s addition.